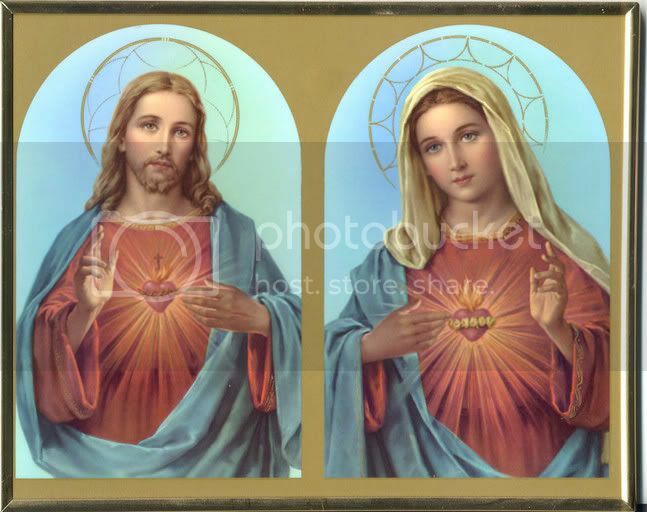 Our Lord revealed to St. Margaret Mary Alacoque "His wish for her to order a picture of the image of that Sacred Heart for people specifically to venerate and have in their homes and also small pictures to carry with them." She wrote this to her superior, Mother Saumaise, on March 2, 1686. Thus was born the devotion of wearing the little Badges. St. Margaret Mary Alacoque always kept a Badge with her and inspired her novices to do the same. She made many Badges and often said this practice was very pleasing to the Sacred Heart. In the beginning, only the nuns of the Visitation were allowed to wear the Badge. It was later spread by Venerable Ana Magdalena Remuzat, a religious of the Visitation who died in the odor of sanctity (1696-1730). Our Lord told this nun that a serious epidemic would afflict the French city of Marseilles in 1720, and that its inhabitants would receive a marvelous help through this devotion to His Sacred Heart. Mother Remuzat, helped by her sisters in the convent, made thousands of Sacred Heart Badges, and distributed them throughout the city where the plague was rampant. Soon afterward, the epidemic stopped. As if by a miracle, many Badge wearers were not infected and even people who got sick experienced extraordinary help through the Badge. Analogous events happened elsewhere. From then on, use of the Badge spread to other cities and countries. The news of the graces obtained through the Badges reached the French court. Maria Lescyznska, the wife of King Louis XV, became devoted to the Badge. In 1748, she received several Badges from Pope Benedict XIV as a wedding gift. 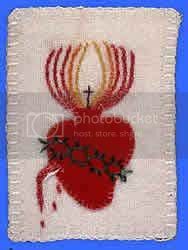 Among the various presents sent by the Pontiff were "many Badges of the Sacred Heart made of red taffeta and embroidered in gold," the records say. The unfortunate French Revolution erupted in France in 1789, a worse punishment than any plague, causing tragic consequences for the whole world. True Catholics found protection in the Most Sacred Heart of Jesus during the period. Many priests, nobles, and people who resisted the bloody anti-Catholic revolution wore the Badge. Even ladies of the court, like the Princess de Lamballe, wore the Badge embroidered with precious materials over the fabric. The simple fact of wearing the Badge became a distinctive sign of those opposed to the French Revolution. Among the belongings of Queen Marie Antoinette, guillotined out of revolutionary hatred, was found a drawing of the Sacred Heart, with the Wound, Cross, and Crown of Thorns, and the inscription, "Sacred Heart of Jesus, have mercy on us!" The Chouans, heroic Catholics from Mayenne (Western France), especially from the Vendee, who resisted the impious French revolutionaries of 1789 and confronted them with energy and religious ardor, embroidered the Badge of the Sacred Heart on their clothes and banners. They shaped it as a coat of arms to reaffirm their Catholic faith and wore it as a symbolic armor for defense against enemy attacks. Many other Catholic leaders and heroes also wore the Badge as a "spiritual armor." 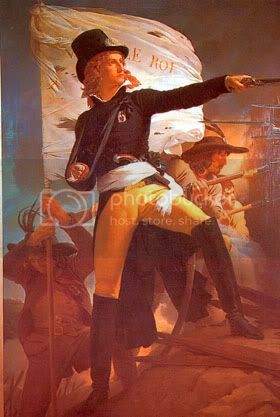 They fought and died in defense of Holy Mother Church like the brave peasants who fought under Andreas Hofer (1767-1810), known as the "Chouans from the Tyrol." These men wore the Badge as spiritual protection in the battles against Napoleon's army that invaded the Tyrol. The Cristeros in Mexico, in the first half of the 20th century, also wore the Badge. They took up arms against the anti-Christian governments that oppressed the Church in Mexico. In Spain, the famous Carlista regiments called "requetes" likewise wore the Badge. They were famous for their religious piety and boldness on the battlefield, and their intervention was decisive for the triumph of the anti-Communist Catholics in the Civil War of 1936-1939. More recently, similar events took place in Cuba. the Catholic Cubans who fought against the Communist regime had a special devotion to the Sacred Heart of Jesus. When they were imprisoned and taken to the 'paredon" (shooting wall) for summary execution, they faced Fidel Castro's executioners with the cry, "Viva Cristo Rey!" (Long Live Christ the King!). After Castro's Communist tyranny took over Cuba, beautiful statues of the Sacred Heart wee demolished and replaced with representations of Che Guevara. Thus, statues of the Sacred Heart, which represented Divine Mercy and foregiveness, were replaced with likenesses of a guerilla fighter who hands were soaked in innocent Catholic blood which he had caused to flow in several Latin american countries. 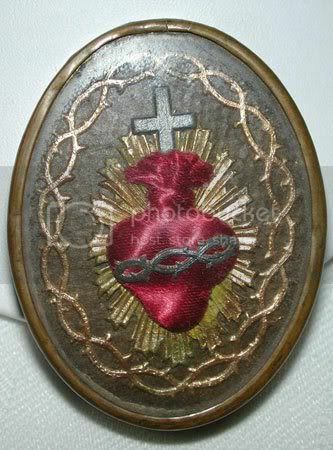 In 1870, a Roman lady wishing to know the opinion of the Holy Father Pius IX about the Badge of the Sacred Heart of Jesus, presented him with one. Touched by the sight of this emblem of salvation, the Pope approved the devotion forever, and said, "This, Madam, this is an inspiration from Heaven. Yes, from Heaven." After a short moment of silence, he added," I am going to bless this Heart and want all Badges made after this model to receive the same blessing, so that in the future it will not be necessary for the blessing to be renewed by a priest. And I want Satan to be unable to cause any harm to those who wear this Badge, symbol of the Adorable Heart of Jesus." Wishing to foster the pious habit of wearing the Badge, in 1872 the Blessed Pope Pius IX granted one hundred years' indulgence to all who wear this emblem and pray daily one Our Father, one Hail, Mary, and one Glory be. "Open Thy Sacred Heart, O Jesus! Show me its beauty and unite me with It forever. May the throbbing and all the movements of my heart, even during sleep, be a testimony of my love and tell Thee unceasingly, 'Yes, Lord Jesus, I adore Thee...accept my poor good actions...grant me the grace of repairing the evil done...so that I may praise Thee in time and bless Thee for all eternity. Amen. Modern Sacred Heart Badge, available here.